With the Honda Cliq, the Japanese brand is targeting "up-country customers with a progressive mindset". But will the Cliq really click with its target audience? Read on to find out! 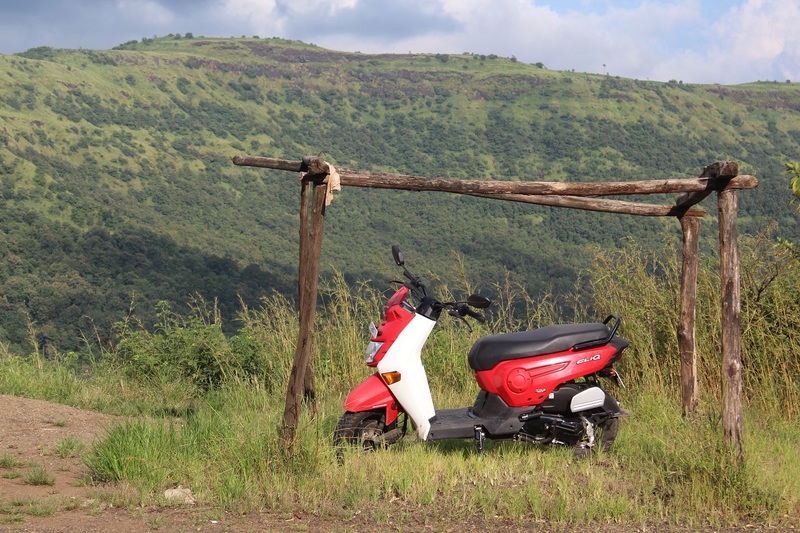 Two-wheelers in India were used for utilitarian purposes in many rural regions. The TVS 50, launched in 1980, was the first two-seater moped in the country. After it rolled out of Hosur, the moped went on to become one of the most preferred two-wheelers for customers looking for a sturdy two-wheeled mule. 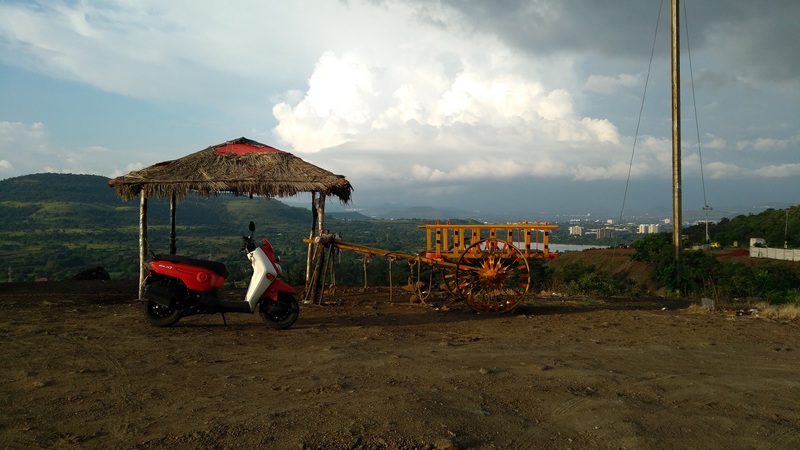 Now, Honda seeks to grab the piece of the ‘utilitarian pie’, so to speak, with its latest offering, the Cliq. Honda launched it in June, and priced the scooter at INR 42,499 ex showroom, Delhi. The Honda Cliq follows a rather quirky design with the halogen headlamp mounted on the apron. The handlebar is exposed, with only a plastic cover on the clamp. The front indicators are mounted on the sides of the apron. 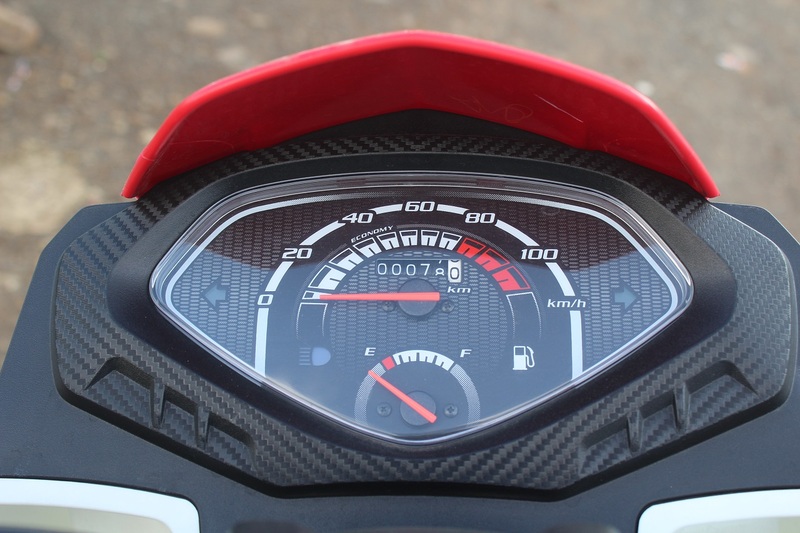 The analogue instrument cluster is mounted on the apron, instead on the handlebar, leaving it free of clutter. The cluster comes with a faux carbon-fibre finish for sportiness. The instrument cluster is pretty basic- with a speedometer, odometer, tell-tale lights for indicators and high-beam; and a fuel gauge. The choke lever is on the apron. The side portions of the front apron have cavities, which could’ve been closed to store items like bottles or umbrellas. But that’s just my suggestion. A neat-looking circular design element keeps side body panels busy. Apart from the ‘Cliq’ logo, additional stickers are available as an option. The rear body panels are black, and sport the bulb-type tail light and indicators on the sides. The scooter looks more youthful, than no-frills utilitarian. 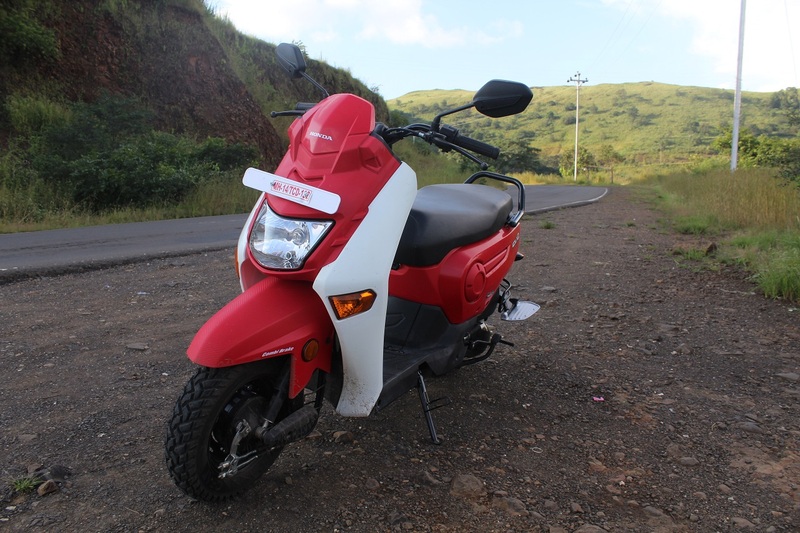 The Red and White paint scheme adds a nice contrast to the vehicle and it does grab eyeballs, making people wonder what kind of two-wheeler it is. A passer-by asked me if it runs of battery! I got the same enquiry when I rode the Navi as well. The body panels are plastic and the build quality could have been better. A couple of sections of the snap-fit panel below the seat dislocated when I went through a bad stretch. Another grouse is that there is no hook below the seat. It’s ironic considering this scooter is marketed to be utilitarian. The seat is a single piece unit that is quite wide and long for comfortable seating. However, the seat cushioning could have been a little softer. 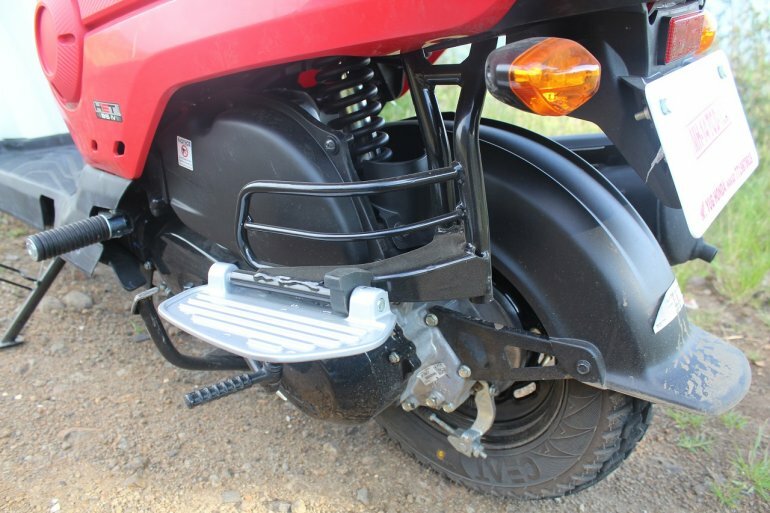 The pillion grab rail is sturdy, and the lock for the underseat storage is behind the seat. Open the seat and you’ll find space enough for a half-face helmet. The optional USB charging port is mounted in this compartment. The weight limit of this underseat storage is 10 kg. The underside of the seat has holders which hold the first-aid kit and the tool kit. Oddly, the side stand is an optional extra, whereas the centre stand is standard. The pillion foot plate on the side is optional as well. The Cliq’s greatest forte is its engine performance. The Activa-sourced 109.19cc single cylinder fan-cooled engine is capable of producing 8 bhp of power at 7,000 rpm. A peak torque of 8.94 Nm comes in at 5,500 rpm. 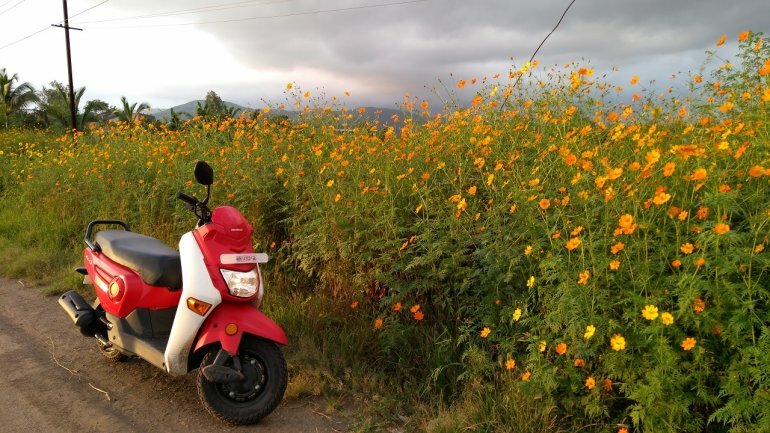 The engine note is a refined hum at low speeds, which is characteristic of a Honda scooter. The powerplant works in tandem with a variomatic transmission. A brisk tug of the torque is felt when accelerating from standstill, and thins down a bit post 50 kmph. Make no mistake, even till 70 kmph, the engine shows no strain. I maxed out at a commendable 85 kmph. The mill feels butter-smooth till 60 kmph. Post that, there are minor vibrations that creep on the floorboard, but they are none too intrusive. It is quite fuel efficient as well. I got 49.1 km/l in a mix of city and highway riding conditions, with the throttle staying at 60 kmph approximately 60% of the time. Keep the speed within the economy limits (30-50 kmph), and it’s possible to touch 55 km/l too. The fuel tank is tiny at just 3.5 litres, which is 0.3 litres less than the Navi! Unlike Navi, there is a fuel gauge in this one to keep an eye on the juice. Coming to the handling department, the Honda Cliq's road manners are quite impeccable. It feels sprightly to flick around, thanks to the simple, light handlebar. The link type front suspension and the rear single shock absorber are on the firmer side, but that aids in on-road handling. The 90/100-10 53J Ceat Gripp tubeless tyres shod on both ends offer decent grip. With a wheelbase of 1,241 mm, the scooter’s high-speed stability is commendable as I did not find it to be unnerving. The light weight, coupled with the strong low end torque put a smile on your face when you zoom around, weaving through traffic. 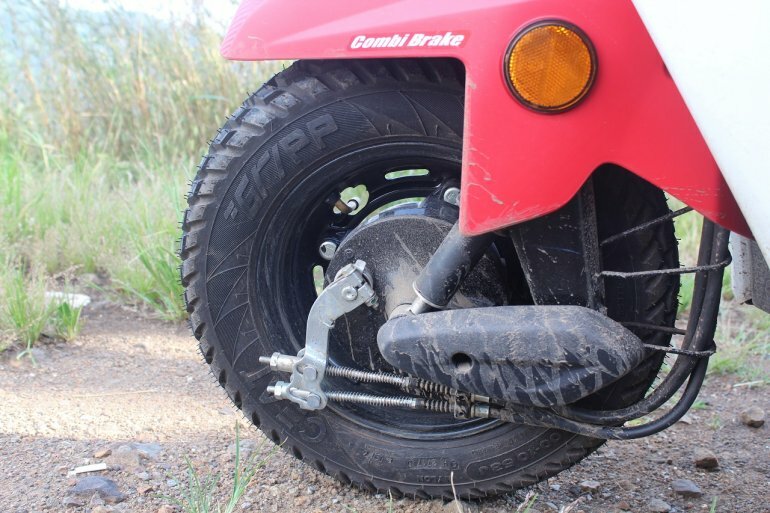 Speaking about the heft, the scooter weighs 102 kg, kerb. The 130 mm drum brakes on both ends with CBS bring the scooter to a swift halt without fuss. The bite is ample and the feel is progressive as well. However, things are different when it comes to ride quality off the road. While the tyres ensure control over uneven surfaces as well, the hard suspension isn’t forgiving. I feel the front suspension needs to have better damping for rural environment where there are a lot of bad roads. 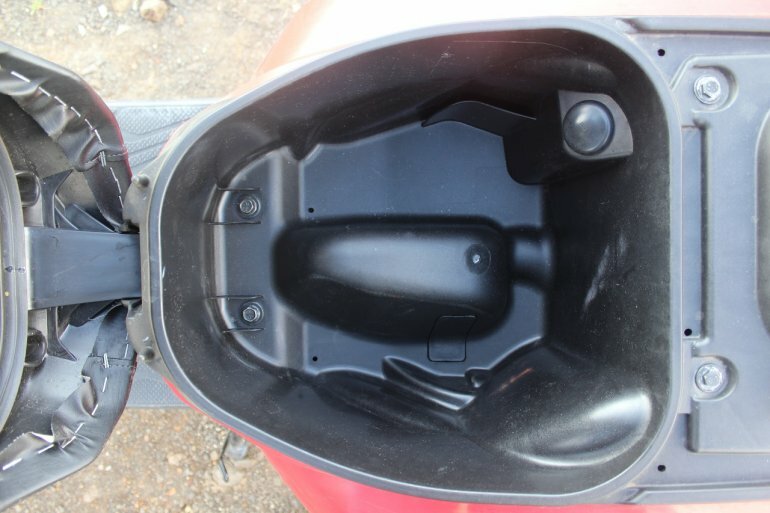 The rear suspension is manageable, but Honda could’ve provided the Cliq with a telescopic front fork which could have improved the scooter’s rideability on bad roads considerably. On the plus side, the ground clearance is ample, at 154 mm (1 mm more than the Activa 4G). Interestingly, the Navi has 2 mm higher ground clearance than the Cliq. The Honda Cliq has a very refreshing design, with lively handling backed by a punchy little engine. It’s an ideal alternative for those who are looking for a two-wheeler that is as radical-looking as the Navi but don’t want to compromise on practicality as well. Instead of an out-and-out rural luggage hauler, the Cliq is more of an uber-chic scooter with a dose of convenience.